Click here to visit and 'like' our Facebook page. RBS Treeworks offers a professional and affordable tree surgery service to all customers in the Romsey, Southampton, Winchester, Salisbury and surrounding towns and villages. 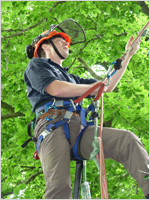 The company was started by Craig Ryan in 2005, after completing his National Certificate in Arboriculture at Moulton Agricultural College in Northampton. He successfully ran RBS Treeworks in Northampton for 8 years before relocating to Hampshire. Over the years we have been fortunate enough to work on varied and challenging projects which have allowed us to demonstrate our skills. It has resulted in a very happy customer base. Some of our customers have been kind enough to provide us with references, some of which can be viewed below. We have a genuine interest in the wellbeing of trees and this is demonstrated in our work. From our initial site visit to view your trees, our aim is to understand your motivation for the tree work so we can advise you on the best course of action available at the best possible price. We will provide you with a written itemised quotation of the works to be undertaken. Under our services page, you will find a list of all the services available, our qualifications for tree work and the answers to some frequently asked questions. We operate within an approximate 20 mile radius of Romsey which includes North Baddesley, Chandlers Ford, Eastleigh, Southampton, Hedge End, Totton, New Forest, Lyndhurst, Stockbridge, Winchester, Salisbury and other surrounding villages. If you would like to see how we can help you, then we would like to hear from you. You can contact us either by phone or email. We look forward to hearing from you! Revisited requirements before starting and did job well. Tidied up and removed all rubbish/cuttings afterwards. Very competent and professional. One tree was a very tall silver birch in a restricted location. Very neat job, works carried out when agreed and to quotation. Removed all cuttings from garden, very pleased. Very professional job. Didn't just cut back what was overhanging, which would have created an odd shaped tree, but gave the tree a natural shape. Very pleased with the work. Craig and team turned up as agreed and carried out works with no fuss and bother to us. Sorry about Dog Mess, should have said before hand. Site was cleared and they left no signs of rubbish behind. I will be calling them with no hesitation for any extra works in the future. A very professional firm and a pleasure to do business with. Work was carried out professionally and in a very safe manner, with regards to themselves and us, the home owners. 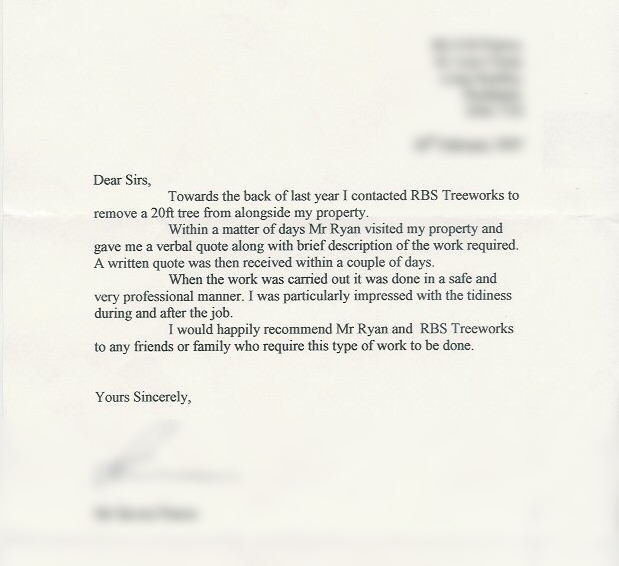 We would recommend RBS Treeworks to anybody. The people were courteous and left the work site in very good order. The work done was of an excellent quality, very reasonable and Craig and his team were pleasant and professional to deal with. I would definitely recommend their work and will make a point of using them for any future work. Knowledgeable, good advice, very tidy. Very pleased with finish. Would recommend. From first meeting to completion, Craig was highly professional. His quote was very reasonable. He agreed a convenient time to complete the work. He arrived as agreed and checked with neighbours he was not inconveniencing them. He made the area safe (coned off) and worked quickly and efficiently in the most appalling weather. He worked with good humour and left the area neat and tidy. I can unreservedly recommend his services - great job done. From first meeting to completion of the work, Craig was highly professional. He was well prepared, gave his estimate (which was very reasonable) in a timely manner and kept us informed of his planned start date. The work was carried out with a focus on safety (area coned off) and was completed to a high standard with the area left clean and clear afterwards. Craig also spoke to and ensured our neighbours would not be inconvenienced. We would recommend him unreservedly for any work in the future. Thank you Craig! Excellent attitude and workmaship shown from the boss Craig and his mate Olie. Will ask him again in the future. Craig and Ollie were extremely efficient, hard working and polite. We were thrilled with the finished look of our garden and will most definitely be using them again and have no hesitation in recommending them. Great work done by Craig and the team! Explained in detail what they were doing and did a very professional job. Out of control conifers now look neat and tidy. Very tidy and by clearing up ended up taking away some autumn leaves that had fallen. Highly recommend. "When the work was carried out it was done in a safe and professional manner... I would happily recommend Mr Ryan and RBS Treeworks..."
Click the image to enlarge or open a pdf version here. For more testimonials, please view our References page.